Two years ago this week we celebrated the life of my sweet step-father-in-law. He had been on hospice for a few weeks, so his passing wasn’t a total surprise, but it was sooner than we had anticipated and, well, you know…dying is never easy. One of the things I had most in common with our Papa Del was a mutual love of sweets. Even though he was diabetic, he loved him some sugar — especially if it was wrapped up in pie, cake or cookie form. In fact, our biggest argument happened when he tried to steal the last piece of cherry pie one year at Christmas. As we were planning his memorial service and dinner, I knew I had to make the desserts from scratch. Papa loved my homemade goodies and was a willing consumer of all my experiments, good or bad. I chose these because Papa loved the pucker of a good lemon dessert. 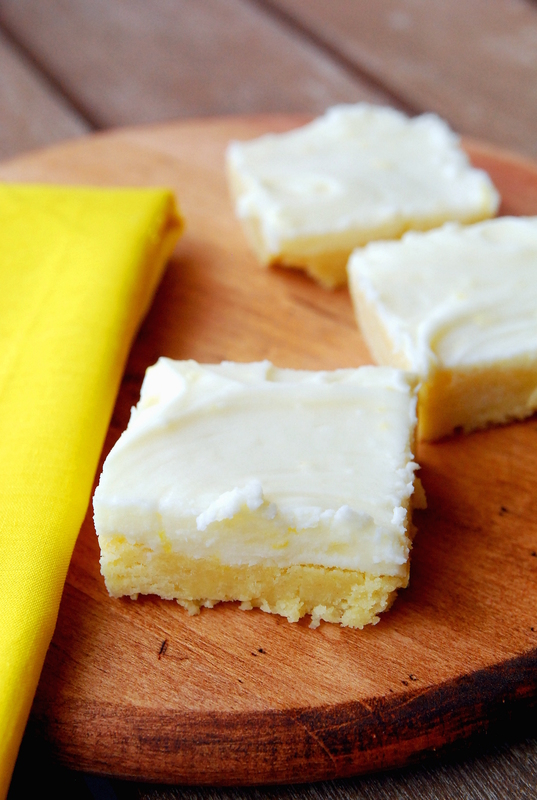 These use real lemon in the bar and the frosting to deliver a pop of flavor. They were the first things to disappear after the service, so I’m pretty sure they were awesome. This recipe is Maria’s from Two Peas and Our Pod. It was written perfectly — I didn’t have to change a thing. 1. Preheat oven to 375 degrees F. Spray a 9x13 pan (I use a glass Pyrex dish) with cooking spray and set aside. 3. In a small bowl, combine granulated sugar and lemon zest. Rub together with your fingers until fragrant. 4. In the bowl of a stand mixer, beat butter and and lemon sugar mixture together until combined. Slowly add the powdered sugar and beat until light and fluffy, about 3 minutes. Add in the eggs, lemon juice, and vanilla. Beat until smooth. Slowly add the flour mixture and beat until just combined. 5. Evenly spread the cookie dough into the prepared pan with a spatula. Bake for 12-14 minutes, or until the bars are slightly set in the middle. You don't want the bars to brown. Remove from the oven and let the bars cool completely. 6. While the bars are cooling, make the lemon cream cheese frosting. In the bowl of a stand mixer, beat the butter and cream cheese until smooth. Add the lemon zest and lemon juice. Slowly add the powdered sugar, 1 cup at a time. Mix until smooth. 7. 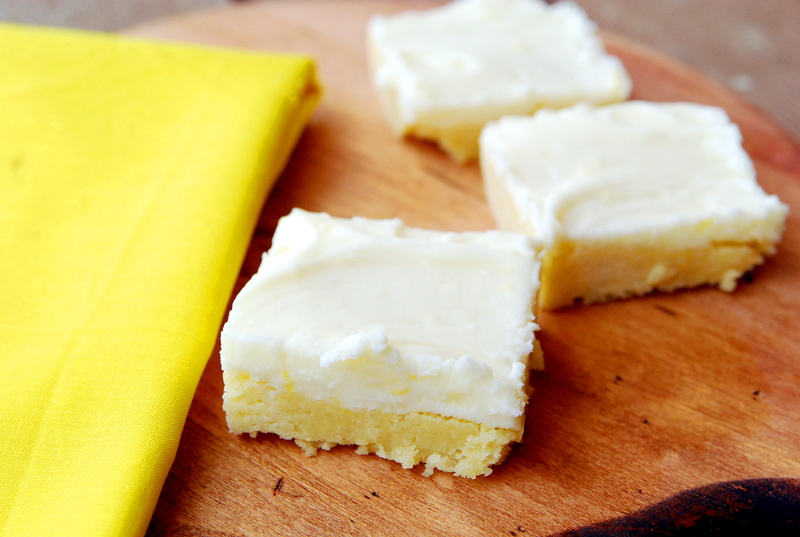 Frost the cooled cookie bars with lemon cream cheese frosting. I always have a little frosting leftover, but use as much as you like! Decorate with colored sugar or sprinkles, if desired. Cut the bars into squares and serve. Note-store bars in an air tight container in the fridge for up to 2 days.